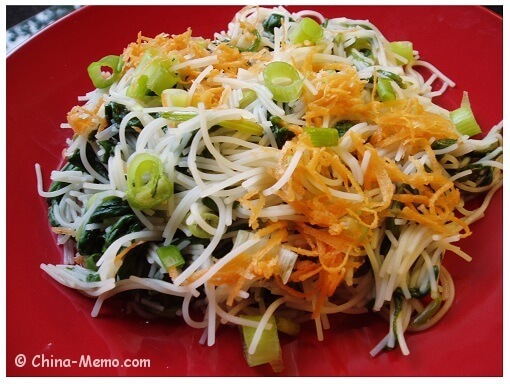 This is my Chinese salad, Chinese spinach with rice noodle. Simply cooked spinach, mixed with salt, sugar, vinegar and sesame oil, an easy and tasty salad dish. 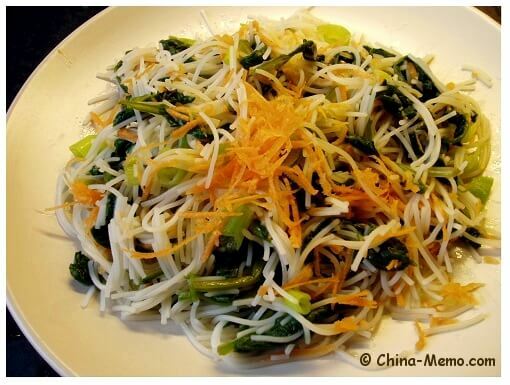 Rice noodles are often seen in the south of China. 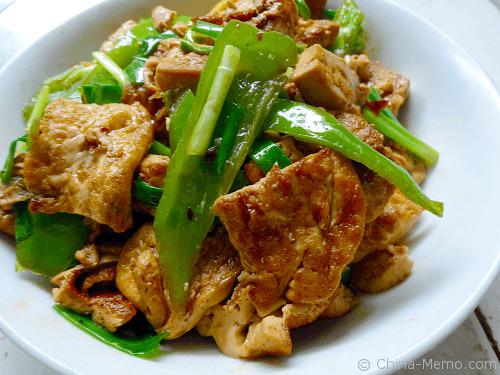 In the north, the noodles are usually made by wheat flour. 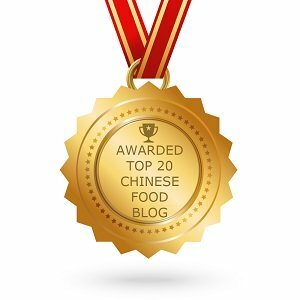 In Chinese they have different names, the rice noodle is called Mi Fen (米粉), and the wheat flour made noodle is called Mian or Mian Tiao （面 or 面条）. There are different types Chinese rice noodles, if look their shape, we have the flat ones, the round ones and the very thin round ones. The first two types are usually served for meals, such as the flat rice noodle fried with meat and vegetables served for lunch and the rice noodle soup for the breakfast. The third type of noodle, the thin rice noodle, is usually used as ingredient to make a dish, either with meat or vegetables, or soup. 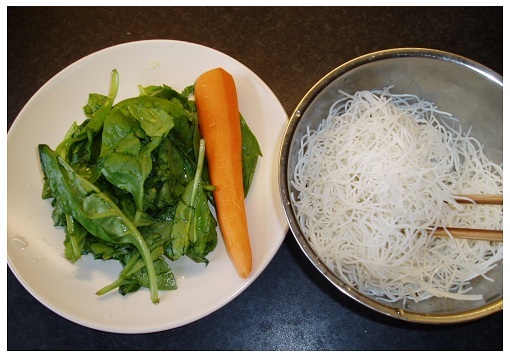 This recipe Chinese spinach with rice noodle uses the thin rice noodle which is available from most local food supermarkets, even in the UK. 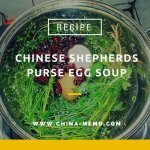 • Prepare the salad dressing, add light soy sauce, sesame oil, salt and sugar in one bowl and mix all ingredients together. Set aside. • Wash the spinach. 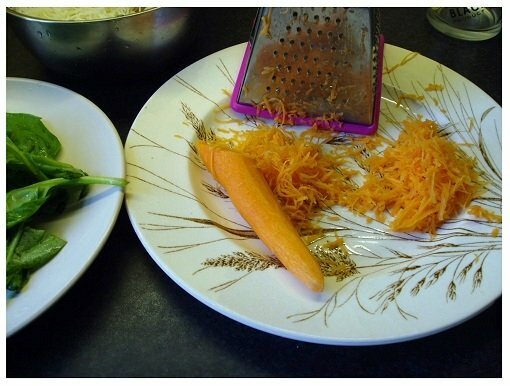 Grid the carrot into thin shreds. Cut the spring onions into small pieces. 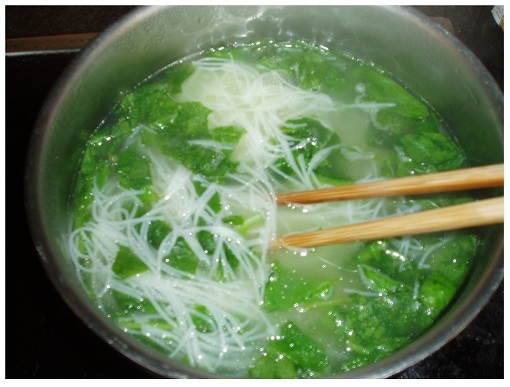 • Bring the water to a boil and add the rice noodle, cook for about 2 minutes. Then add spinach, stir and cook for 1 more minute. Drain it. 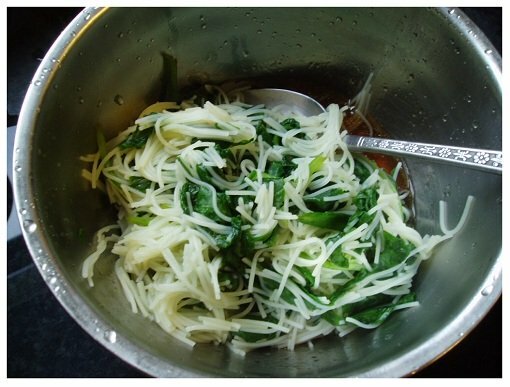 • In the bowl, mix the salad dressing with the cooked spinach and rice noodle. • Garnish the dish with the chopped spring onions and carrots. Done. • Because the rice noodle I got from market was almost cooked, so no need to cook long. If you use the dry rice noodles, it will need a bit longer to cook. • Use light soy sauce rather than the dark one, so that you can keep the vegetable’s natural colour. 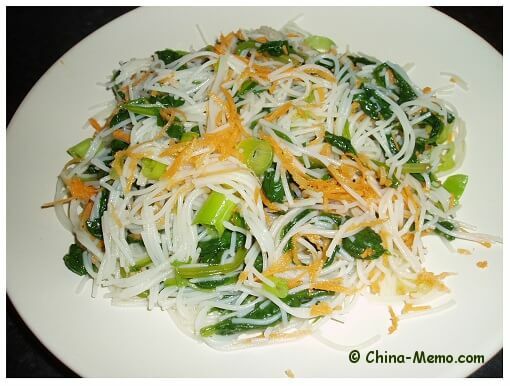 I hope you like this Chinese Spinach with Rice Noodle recipe. 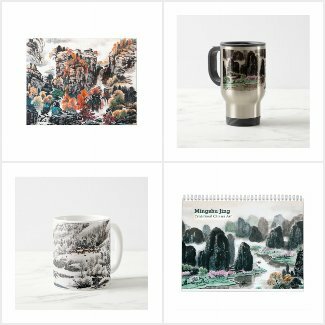 You may also like my other easy Chinese vegetable recipes such as Sichuan style bean spout or Chinese Squash with Garlic.